Seacookie trotted up really well on Sunday morning and Chilli Morning appeared none the worse for his exertions on Saturday. The show jumping looked typically big when I walked it with some interesting related distances. It is a fantastic arena at The Kentucky Horse Park, a stadium we don’t really see in Europe, apart form maybe at Aachen. Cookie came out for the warm up feeling really perky. Yogi Briesner helped me with the fences and everything went very much to plan. With only one clear round in the morning the course was riding as big as it looked. I couldn’t have been happier with the way he performed. In his career he has had an unlucky rail here and there but he never felt like touching anything and it helped that the time was unusually lenient so I didn't have to rush him. 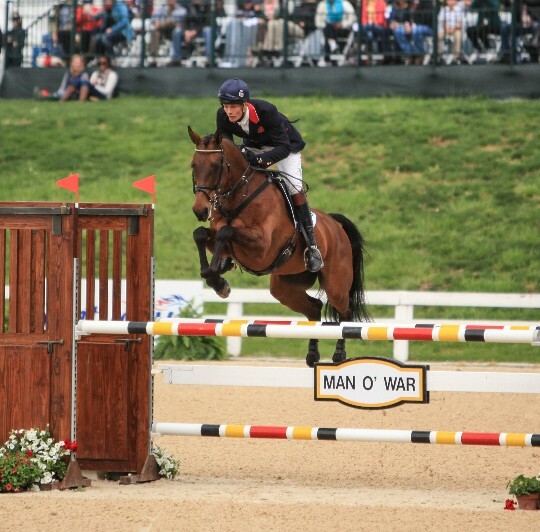 He jumped a fabulous clear, which moved him up into 2nd behind Andrew Nicholson and Quimbo. After the disappointment of Chilli’s cross country Cookie’s performance was a huge relief. As Mary had retired on the cross country as well it would have been a long journey back for the Brits if he hadn’t salvaged something. Annoyingly I managed to bang my hand on Cookie’s wither and I seem to have damaged my little finger somehow! It is quite sore but hopefully wont affect my riding, I am sure once the adrenalin kicks on I wont even feel it. Andrew’s victory means that we both have the opportunity to win the Rolex Grand Slam at Badminton this week and I am really looking forward to riding my too lovely horses Oslo and Parklane Hawk. I landed back in England at 11am on Monday and was riding them by 3pm. The team at home has done a fantastic job, they both feel in very good form and are really blossoming with the Spring sun which has at last arrived. Pete Murphy the British team show jumping trainer came to give me a jumping lesson yesterday. My finger felt fine and they both jumped well. The lorry is being packed and we head off to Badminton later today. Thanks to Margie Shroop for the great photo.